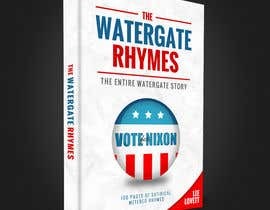 I need an ebook cover for the book entitled, The Watergate Rhymes. Below is information in the event you never heard of the Watergate Scandal. I'm going to add the old cover just as a point of reference. NOTE: YOU CANNOT USE AP IMAGES FOR THE COVER. The day when nostalgic interest in Watergate returned, along with a renewed interest in classic poetry – that which is rhymed and metered has come. The Rhymes view the Watergate saga through the eyes of a largely apolitical observer, who chanced to work five years on Capitol Hill (in the U.S. Senate, primarily dispatching the “Senate Pages”, who ran errands for the Senators). In the process, the author came to personally know a number of the Watergate principals, including the late President Nixon, and many of his closest advisors. As such, the author felt the mood and ethos of the era a bit more than did most. The Watergate Scandal reminds us that “Power corrupts,” and that our leaders must be observed closely and be subjected to reasonable scrutiny by the public and the courts – not because they are innately crooked, but because they are innately human and cannot possibly use the best judgment at all times and that the flush of power can distort and impair their judgment. The purpose of The Watergate Rhymes is not to further malign the already much-denigrated Nixon Administration, but, rather, to educate, reflect and to learn from that consumptive scandal, while using satire to see the humor in the human frailties of that maligned administration – and in ourselves, all with the perspective and understanding that only precious time enables. To put these roughly 100 pages of satirical, metered rhymes in context, it is appropriate, especially for readers not present in the 1970’s, to here tender a summary of the astonishing events now known worldwide simply as the “Watergate Scandal”. On June 17, 1972, a band of political operatives broke into the Democratic National Committee’s (“DNC’s”) headquarters at the Watergate office complex in Washington, D.C. They were caught, red-handed, by a Watergate security guard, Frank Will. Without the alert Mr. Will, there would have been no Watergate Scandal whatsoever. While the extent to which President Nixon was involved in the planning of this event may never be known, evidence later proved that “Committee to Re-Elect the President (“CRP”) and many members, at least, of the White House staff, were involved in planning the break-in, and, further, that the President and most others in his Administration, did become involved in the cover-up of the onerous robbery. (To be fair, the CRP was not the Republican Party; it was an independent organ of Nixon supporters.) Although there are different accounts as to the totals, according to Wikipedia’s summary in 02/28/2015 -- [login to view URL] -- these clandestine acts resulted in the indictment of 69 and the conviction and imprisonment of 48 persons., Faced with virtually certain impeachment, President Nixon resigned (on August 9, 1974) in disgrace unparalleled in American history, but he was pardoned on September 8, 1974, by Gerald Ford, Nixon’s successor, mercifully saving the nation the pain of a trial, conviction and imprisonment of a twice-elected President. In a little over two years, the nation and world had witnessed the most colossal, tragic and unnecessary fall from grace ever recorded of a political icon. Dozens of books have been written about it, the best seller being All the President’s Men, by Washington Post reporters, Bob Woodward and Carl Bernstein (“Woodstein”). To the best of this author’s knowledge, The Watergate Rhymes that you are now reading is the only book of verse about it. You didn`t have to reject all the other entries! You could just leave them with the ratings you gave before. This way you are deminishing the designers work and efforts and also gives a negative reputation points. i apologize for the error...there was a message on my freelancer screen and it made me think I had to reject the ones that didn't win. Greetings! Do you want the same text like on the old cover?